The name “Jean-Luc Ponty” is practically synonymous with jazz violin. A graduate of the Paris Conservatory, Jean-Luc was pursuing a career in classical music when a side gig on clarinet in a college jazz band piqued his interest in jazz in the early ’60s. Soon he was carrying an amplified violin to late-night jam sessions in Paris clubs, receiving raised eyebrows at his choice of such an unusual instrument for playing jazz. Drawn to the cool modern sound of Miles Davis and John Coltrane, Jean-Luc developed a playing technique on violin that captured the bebop harmony, phrasing, and tone of contemporary horn players. Invited to tour with Frank Zappa in the early ’70s, he moved to Los Angeles, where he pioneered the use of electric violins and electronic effects. Soon he was leading his own bands, soloing over his own extended compositions in a jazz-rock fusion style. In the early ’90s, he incorporated elements of West African rhythm and melody into his repertoire as well, forging a new sound that is a cross between jazz fusion and world music. His current touring group consists of piano and a West African rhythm section of electric bass, drums, and percussion. Over the years, Jean-Luc has participated in a number of notable collaborations, including with guitarist John McLaughlin, swing violinists Stéphane Grappelli and Stuff Smith, Indian violinist L. Subramaniam, and banjo virtuoso Béla Fleck. 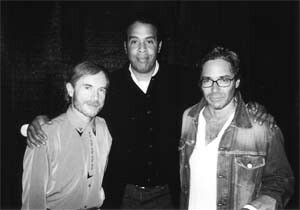 Perhaps his most celebrated side project was a 1994 trio with guitarist Al Di Meola and bassist Stanley Clarke in which the three jazz/fusion giants put aside their electric instruments to create an intimate and exciting acoustic soundscape as “The Rite of Strings.” The group recorded one critically-acclaimed album before disbanding in 1995. Having always enjoyed this acoustic side of Jean-Luc’s playing, I was pleasantly surprised by the news of a reunion tour in the summer of 2004 and I managed to catch them live at the scenic Mountain Winery amphitheatre on a chilly northern California evening. Their set included many of the pieces from their 1995 recording, interspersed with solo numbers from each of the artists. As Stanley remarked after a particularly physically demanding bass solo, “I was trying like hell to put some heat up here. And that hurt like hell, too! Lucky I’ve got Blue Cross for this finger.” As you might imagine, the chilly California winds were no match for the heat generated by this trio. I’m glad to see The Rite of Strings reunited. I never expected it to happen. JLP: Nobody knew if it would happen again! It was a one-time project. But Stanley asked us to participate in a benefit concert last November. He created a scholarship fund for young musicians and every year he organizes a benefit concert. So he asked Al and myself if we would agree to come and play a couple of songs for that show. Which we did and it was fun to do it and we said, “Maybe we should do it again on the road.” And here we are. How did the three of you meet? You said on stage that you met Stanley when he was a teenager. Yeah. I believe he was nineteen. I think it was in the States and I was in New York and Tony Williams had just left Miles Davis and started his own band called “Lifetime.” I went to listen to him with John McLaughlin, guitar, who had just arrived from England. And we connected. So we played in Europe and Tony Williams told me, “I’m going to bring a young bass player who is the new great bass player in New York.” And that was Stanley Clarke. That was 1972. And we have crossed paths ever since. Even played together on the Downbeat poll winner TV show in Chicago for PBS with Chick Corea on piano, Billy Cobham, and Dizzy Gillespie. There was a wish to do a project together someday but we were involved in our personal careers. It’s really Al’s idea to do this trio, because he started switching to an acoustic format in the late ’80s, early ’90s. We had crossed paths because I’d seen him with Chick Corea’s band, “Return to Forever.” We’d never played together before, but we’d met a few times. Al called me in the early ’90s to talk about his idea of doing this trio, with Stanley and me. At the time I was skeptical about playing acoustic violin. Although this is my background –– I studied classical violin since age five until I graduated from the conservatory –– but then once I got into jazz and into rock and started with amplification, my identity became as an electric violinist. Were you playing any acoustic violin at that point? At home, yes, to practice, but not really on stage. So I was not sure if I would be able to transfer my style onto an acoustic violin. You know, you feed from the sound as well and it made me play a certain way. After all these years to have that big, powerful sound, suddenly to have a smaller acoustic sound startled me at first. So I was not sure that I liked the idea of doing an acoustic trio. But we tried. We got together in the studio and I must say then I saw the possibilities. It was very exciting with musicians of that level. We did a first tour in Europe in July 1994. Did you pick up any new techniques from one other? We did not learn techniques from each other; we had three different instruments. But we had to come up with a way of backing up the other soloists that we are not used to. Stanley really liked the idea of having no percussion, no drummer. It’s harder, but more original this way. Then I had to come up with ways to play some background parts for my colleagues. I do a little bit of that but not as much with my band. So you had to develop a backup style. You did a lot with tapping the bow, tapping the tip sometimes for a different sound. Exactly. Because I’m trying to create a frame for the soloist, whether it’s Al or Stanley. Especially if it’s Stanley, because he is the drummer of the band. When he starts soloing, you really need the downbeats, some solid beats so that he can fly over it with his improvisation. I’m the one who will give these marks –– next bar, next chord change. That’s a responsibility that came to me which I had to develop. This is the fourth show (of this tour) and already I start finding new ideas. I feel a lot more confident doing the rhythm. We rehearsed for a week before starting this tour to refresh our memories. Ten years is a long time without playing this music! But tonight, I found some new ways of providing this rhythmic foundation.